President Muhammadu Buhari will soon appoint more ministers into his cabinet. Buhari will also make board appointments, a demand by his party members over the months. President Buhari gave hints of the new appointments in a speech delivered on Tuesday to the National Executive Committee meeting of the All Progressives Congress at its national secretariat in Abuja. Buhari at the moment has 36 ministers, with 14 of them being ministers of state. He doubles as the full Minister of Petroleum Resources. When he appointed them in 2015, he said he was having a trimmed cabinet to avoid waste. Now faced by demands by his party for more inclusiveness and patronage, he said he would be shifting ground soon. He did not indicate whether he will do a cabinet reshuffle. Similarly, the President also hinted he will be appointing more people into the boards of government agencies and corporations. He said: “Last year I said we would re-constitute the Boards of Parastatals. I must regret the fact that we have not done so, for many reasons. In the last week, the President has stepped up consultations with the party bigwigs and supporters who brought him to power in 2015, indications that he was preparing grounds for a run in the 2019 election. On Monday night, he hosted a caucus of the party and held another meeting with the leaders of the National Assembly, Speaker Yakubu Dogara and Senate President Abubakar Bukola Saraki. The President, who survived a serious ill-health that took him away for about six months, thanked his party men and women for their prayers and good wishes in the restoration of his health. Buhari said: “I wish to thank you all Party leaders for helping to keep the government running smoothly during my prolonged absence. 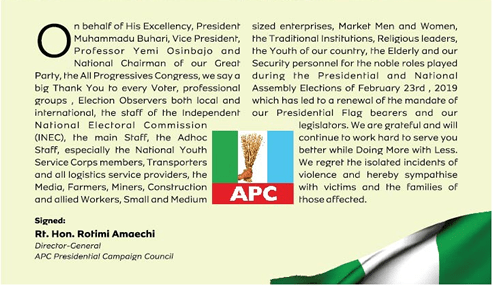 “I would like to start by commending our Party Leadership chaired by His Excellency, Chief John Oyegun. The Chairman and I worked harmoniously during 1984-85 in a previous government. Happily, circumstances have brought us again to positions of leadership in the country. “I want to thank Chief Oyegun and his staff for steering the party in the last two and a half years. Sometimes it is easier to manage failure than to manage success – and a big success such as that we have achieved. “I must also commend the leadership of the National Assembly led by Senate President His Excellency, Dr. Abubakar Bukola Saraki and Rt. Hon. Speaker Mr. Yakubu Dogara. I must place on record the cooperation and understanding of the National Assembly including some non-APC members who rose above petty party interests and acted in the national interest. Buhari also used the speech to review the progress made so far by his administration. He said: “We can be proud of our achievements in the last two years, Boko Haram, Niger Delta, Regular Fuel, Improved Power, TSA, Agriculture and Fertilizer, above all, the knowledge that corruption will not be tolerated in this Government. We all know there is CHANGE. “Nigeria’s prestige has gone up, Nigeria is now credit–worthy, a clear testimony of which was the over-subscription of the Euro-Bond by 4 times. “Let me thank you all again for the commitment and dedicated service to our Party and to remind you that much more will be required of you in the coming months. I hope we can continue to depend on you.